The Man from U.N.C.L.E. is a 2015 American action spy film directed by Guy Ritchie and written by Ritchie and Lionel Wigram. It is based on the 1964 MGM television series of the same name, which was created by Norman Felton and Sam Rolfe. The film stars Henry Cavill, Armie Hammer, Alicia Vikander, Elizabeth Debicki, Jared Harris, and Hugh Grant. The film was produced by RatPac-Dune Entertainment and Davis Entertainment. In 1993, John Davis obtained the rights for a film adaptation based on the original series. However, the film fell into development limbo due to multiple script rewrites. Over the years, Matthew Vaughn, David Dobkin, and Steven Soderbergh were optioned for directing until Ritchie signed on in March 2013. The film premiered at Barcelona on August 2, 2015 and was released on August 14, 2015, by Warner Bros., receiving mixed reviews from critics and grossing $109 million worldwide on a $75-84 million budget. 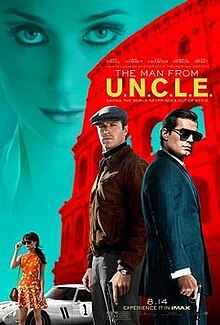 In 1963, at the height of the Cold War, professional thief-turned CIA agent Napoleon Solo extracts Gaby Teller, daughter of Dr. Udo Teller, an alleged Nazi scientist-turned United States collaborator at the end of World War II, from East Berlin, evading KGB operative Illya Kuryakin. He later reports to his superior, Sanders, who reveals that Gaby's maternal uncle Rudi works in a shipping company owned by Alexander and Victoria Vinciguerra, a wealthy Nazi sympathizer couple who intend to use Teller to build their own private nuclear weapon and give it to lingering Nazi elements. Due to the potentially world-ending nature of this crisis, the CIA and KGB have reluctantly teamed up, and Solo and Kuryakin are ordered to stop the Vinciguerras from succeeding, with both men secretly assigned to steal Udo Teller's research for their respective governments. The trio travels to Rome, where Gaby and Kuryakin reluctantly pose as an engaged couple, and Solo pretends to be an antiquities dealer. Solo deduces they are being monitored and instructs Kuryakin not to defend himself from muggers so as to preserve this cover. Despite their hostilities towards each other, Kuryakin heeds his advice and does not react when his father's prized watch is stolen. Later, at an auto racing event promoted by the Vinciguerras, Solo and Gaby flirt with Victoria and Alexander to obtain information about Teller. Meanwhile, Kuryakin acquires evidence the Vinciguerras were recently exposed to radiation, indicating that their weapon is near completion. Solo and Kuryakin begrudgingly join forces to break into a Vinciguerra shipping yard, in which they find traces of uranium. After accidentally setting off the alarm, they escape into the water but find their way blocked. During a scuffle with the guards, Kuryakin nearly drowns. Solo escapes but surprises himself by returning to save Kuryakin. Although a suspicious Victoria pursues them with her henchmen, Solo and Kuryakin manage to slip past into their own rooms undetected. Victoria and Solo spend the night together. The following day, Gaby meets with Rudi and Alexander to discuss a job, but unexpectedly betrays Kuryakin and Solo to them. Kuryakin escapes but Victoria drugs and captures Solo and takes him to a nearby warehouse. There, Rudi, who is revealed as an infamous Nazi war criminal, tortures Solo in an electric chair. Solo is rescued by Kuryakin, who tortures Rudi. Rudi reveals that the weapon is hidden in an island fortress where Gaby has been reunited with her father. The chair malfunctions and Rudi is killed. Solo and Kuryakin travel to the fortress. To protect Gaby, Dr. Teller pretends to resume work on the weapon but intends to sabotage it. Victoria quickly sees through this deception, and has Alexander imprison Gaby as an incentive. Victoria kills him as soon as he has finished the weapon. Meanwhile, Solo and Kuryakin are approached by Alexander Waverly, a high-ranking MI6 operative who reveals that Gaby is an undercover agent under his employment. He and members of the Special Boat Service help Solo and Kuryakin infiltrate the Vinciguerras's compound. While they search the compound, Solo finds Kuryakin's stolen watch on a guard. Vinciguerra then attempts to escape with Gaby and the warhead, but is intercepted and killed. Solo retrieves the disc with Teller's research, but the warhead Vinciguerra was taking with him was a non-nuclear secondary missile. Victoria has left undetected on another boat with the real warhead. Solo is able to contact Victoria via radio and keep her on the line long enough for Waverly to locate her and launch a homing missile, destroying the nuclear weapon and the boat, taking Victoria with them. Kuryakin confronts Solo in his hotel room, intending to kill him and steal the disc for the Soviet Union, but changes his mind when Solo produces Kuryakin's father's stolen watch. They instead share a drink on the terrace and burn the contents of the disk, so as to not give either of their countries the upper hand in the arms race. Reuniting with Gaby and Waverly, they are told that the trio has been reassigned to a new international organization under Waverly's command. Waverly gives them a new mission in Istanbul under a new codename: U.N.C.L.E. Producer John Davis optioned the film rights to the 1960s TV series in 1993, setting up a development deal for an adaptation with Warner Bros. and series producer Norman Felton. Davis has estimated that he commissioned 12 or 14 different scripts over the course of 20 years, with writers Jim and John Thomas, John Requa, Glenn Ficarra, and Scott Z. Burns. Quentin Tarantino was briefly attached following the success of Pulp Fiction, but opted to make Jackie Brown instead. The Man from U.N.C.L.E. continued to labor in development hell with directors Matthew Vaughn and David Dobkin. Steven Soderbergh was attached to direct Scott Z. Burns' screenplay, with production slated to begin in March 2012. Executives from Warner Bros. wanted the budget to stay below $60 million, but Soderbergh felt that amount would not be adequate to fund the 1960s-era sets, props, and international settings required for the film. Emily Blunt was nearly cast as the female lead, but she left the project shortly after Soderbergh departed in November 2011. Guy Ritchie signed on in March 2013. On July 31, 2013, it was announced that Ritchie's adaptation would start filming in September 2013 in London and Italy. The final production budget was approximately $75 million US. In November 2010, George Clooney showed interest in the film, and was in talks for the lead role of Napoleon Solo, but he left in September 2011 due to a recurring back injury. After Clooney's departure, actors including Joseph Gordon-Levitt, Ryan Gosling, Channing Tatum, Alexander Skarsgård, Ewan McGregor, Robert Pattinson, Matt Damon, Christian Bale, Michael Fassbender, Bradley Cooper, Leonardo DiCaprio, Joel Kinnaman, Russell Crowe, Chris Pine, Ryan Reynolds, and Jon Hamm were considered for the lead role. On March 18, 2013, Tom Cruise was in early talks to take the lead in the film. Armie Hammer was cast in the second lead role as Illya Kuryakin on April 24, 2013, with Cruise set as Solo. Swedish actress Alicia Vikander joined the film on May 8, 2013, as the female lead. On May 23, 2013, Cruise dropped out of the film, due to his commitment to Mission: Impossible – Rogue Nation. British actor Henry Cavill replaced Cruise. Elizabeth Debicki was cast in a femme fatale role on July 31, 2013; Rose Byrne and Charlize Theron were earlier considered for the same part. On August 8, 2013, Hugh Grant joined the cast as Alexander Waverly, the head of United Network Command for Law and Enforcement (U.N.C.L.E). Jared Harris was cast as Sanders on September 4, 2013, and Luca Calvani was cast as a villain, Alexander. Simona Caparrini was also cast to play Contessa. Principal photography on the film commenced on September 9, 2013. In October 2013, filming was being under way at the Old Royal Naval College in Greenwich, Royal Victoria Docks, London and Goodwood Motor Racing Circuit in West Sussex, UK. Filming took place in various locations throughout Italy, including the Gulf of Naples, and Baiae Castle. Kuryakin and Teller's first outings as an assumed couple were shot at just below the Spanish Steps; the Grand Hotel Plaza, in Via del Corso; and in the gardens of ancient Theater of Marcellus. Two locations stood in place for Berlin sites on either side of the wall: the public toilet fight between Solo and Kuryakin was shot in Regent's Park in London, while the car chase during the movie's first act was shot in Chatham Historic Dockyard, Kent UK. Director Guy Ritchie finalized the script throughout production: "He's quite intuitive and tends to constantly rewrite stuff, which he does even when they're shooting. He'll rewrite things in the morning if they're shooting that day, working with the actors if something doesn't feel right." says long term collaborator David Allcock. The film was originally set for a January 16, 2015 release, but on August 12, 2014, Warner Bros moved the film's release date from January 16, 2015 to August 14, 2015. The Man from U.N.C.L.E. was released on DVD and Blu-ray on November 17, 2015 by Warner Home Video. The Man from U.N.C.L.E. grossed $45.4 million in North America and $64.4 million in other territories for a worldwide total of $109.8 million, against a production budget of $75 million. The film grossed $900,000 from its early Thursday screenings and $4.8 million on its opening day. In its opening weekend, the film grossed $13.4 million, which was about $5 million below expectations, finishing 3rd at the box office. It opened in Russia with $3.1 million. In the United Kingdom, it opened alongside Sony Pictures' Pixels, earning $2.3 million, debuting at number 4 for Friday-to-Sunday, while Pixels was at No. 1 with $4.2 million, including previews during the week. Warner Bros did not preview The Man from U.N.C.L.E. Across Asia, it generated $2.7 million from six countries and $1.7 million in Australia. On Rotten Tomatoes, the film has an approval rating of 66% based on 247 reviews, with an average rating of 6.2/10. The site's critical consensus reads, "The Man from U.N.C.L.E. tries to distract from an unremarkable story with charismatic stars and fizzy set pieces, adding up to an uneven action thriller with just enough style to overcome its lack of substance." On Metacritic, the film has a weighted average score of 55 out of 100, based on 40 critics, indicating "mixed or average reviews". On CinemaScore, audiences gave the film an average grade of "B" on an A+ to F scale. In April 2017, it was reported that Wigram was working on the script for a sequel, at the suggestion of Hammer; Cavill stated that he would be excited to return for the sequel. A 3D action game based on the film titled Mission: Berlin was released on iOS and Android. It featured sneaking, shooting, and getting in and out of drivable vehicles in the style of open world games. The player can choose to play as Solo or Kuryakin. There was also a multiplayer death match. As of December 2018, the game has been removed from both marketplaces. ^ "THE MAN FROM U.N.C.L.E. (12A)". British Board of Film Classification. July 6, 2015. Retrieved July 6, 2015. ^ Lang, Brent (August 16, 2015). "Box Office: 'Straight Outta Compton' Debuts to Scorching $56.1 Million". Variety. Retrieved August 15, 2015. ^ a b Anthony D'Alessandro (August 15, 2015). "'Compton' Rivals Previous August Tentpoles With $22.8M Friday; 'U.N.C.L.E.' Shows Gray Hair – Late Night B.O." Deadline Hollywood. (Penske Media Corporation). Retrieved August 15, 2015. ^ a b "The Man from U.N.C.L.E. (2015)". Box Office Mojo. Retrieved February 8, 2016. ^ Jon Burlingame (July 31, 2013). "Guy Ritchie, Henry Cavill, Armie Hammer Try to Crack U.N.C.L.E. Movie Challenge". Variety. Retrieved April 14, 2015. ^ "Steven Soderbergh Spies Other Plans, Won't Direct 'The Man From U.N.C.L.E.'". indiewire.com. November 18, 2011. Retrieved August 15, 2013. ^ Justin Kroll (April 16, 2012). "Blunt joins Cruise in 'All You Need Is Kill'". Variety. Retrieved April 14, 2015. ^ "Steven Soderbergh Exits Warner Bros.' 'Man From U.N.C.L.E.'". hollywoodreporter.com. November 18, 2011. Retrieved August 15, 2013. ^ a b "Tom Cruise Eyeing 'The Man From U.N.C.L.E.' With Guy Ritchie At Warner Bros". deadline.com. March 18, 2013. Retrieved August 15, 2013. ^ "The Man From U.N.C.L.E. Finally Starts Filming in September". comingsoon.net. July 31, 2013. Retrieved August 15, 2013. ^ "'Man From U.N.C.L.E.' aims to start filming in September". hitfix.com. August 2, 2013. Retrieved August 15, 2013. ^ "George Clooney Interested in Steven Soderbergh's 'Man From U.N.C.L.E.' Remake". slashfilm.com. November 17, 2010. Retrieved August 15, 2013. ^ "George Clooney Dropping Out Of Steven Soderbergh's 'The Man From U.N.C.L.E.'". deadline.com. August 29, 2011. Retrieved August 15, 2013. ^ "George Clooney back injury forced 'Man From U.N.C.L.E.' exit, says writer". digitalspy.co.uk. September 7, 2011. Retrieved August 15, 2013. ^ "Bradley Cooper Will Not Be Steven Soderbergh's 'Man From U.N.C.L.E.'". slashfilm.com. November 10, 2011. Retrieved August 15, 2013. ^ "'Lone Ranger' Armie Hammer To Star With Tom Cruise In 'Man From U.N.C.L.E.'". deadline.com. April 24, 2013. Retrieved August 15, 2013. ^ "Alicia Vikander Finds Her 'Man From U.N.C.L.E.' for Warners". variety.com. May 8, 2013. Retrieved August 15, 2013. ^ "Tom Cruise Exits 'Man from U.N.C.L.E.' Due to 'Mission: Impossible 5'". firstshowing.net. May 24, 2013. Retrieved August 15, 2013. ^ "Tom Cruise Exits 'Man From U.N.C.L.E. ;' Warner Bros Recasting For Fall Start". deadline.com. May 24, 2013. Retrieved August 15, 2013. ^ "'Man of Steel' Star Henry Cavill Eyes Lead in WB's 'Man From U.N.C.L.E.'". variety.com. May 28, 2013. Retrieved August 15, 2013. ^ Burlingame, Jon (July 31, 2013). "Guy Ritchie, Henry Cavill, Armie Hammer Try to Crack 'U.N.C.L.E.' Movie Challenge". Variety. Retrieved October 18, 2013. ^ "Henry Cavill In Talks For 'Man From U.N.C.L.E.' Lead". deadline.com. May 28, 2013. Retrieved August 15, 2013. ^ "'Great Gatsby's' Elizabeth Debicki Attracted to 'Man From U.N.C.L.E.'". variety.com. July 31, 2013. Retrieved August 15, 2013. ^ "Hugh Grant Joins 'Man from U.N.C.L.E.'". hollywoodreporter.com. August 8, 2013. Retrieved August 15, 2013. ^ Rebecca Ford (September 3, 2013). "Jared Harris Joins 'Man From U.N.C.L.E.'". The Hollywood Reporter. ^ "Luca Calvani Lands Villain In 'Man From U.N.C.L.E.,' Signs With Paradigm". deadline.com. September 12, 2013. Retrieved September 13, 2013. ^ "Simona Caparrini Talks About Henry Cavill on Set of The Man From U.N.C.L.E." www.HenryCavill.org. February 27, 2014. ^ "Production begins on 'The Man From U.N.C.L.E.'". gmanetwork.com. September 11, 2013. Retrieved September 11, 2013. ^ Katie Amey (July 24, 2015). "From the iconic Piazza de Spagna in Rome to the picturesque Bay of Naples: New Guy Ritchie film The Man From U.N.C.L.E. highlights Italy's breathtaking beauty spots". Daily Mail. Retrieved August 5, 2015. ^ Kent Film Office. "Kent Film Office The Man from U.N.C.L.E Article". ^ "Location by Atlas of Wonders". ^ "Conversation Catch Up with David Allcock". ^ "Daniel Pemberton to Score Guy Ritchie's 'The Man from U.N.C.L.E.'". filmmusicreporter.com. July 17, 2014. Retrieved July 19, 2014. ^ "The Man from U.N.C.L.E. (2015)". Soundtrack.Net. Retrieved August 24, 2015. ^ "The Man From UNCLE: Behind The Score video". ^ "Warner Bros Dates 'Man From U.N.C.L.E.' For 2015 MLK Weekend; Will Smith's 'Focus' Set For February 2015". deadline.com. February 20, 2014. Retrieved February 21, 2014. ^ "Warner Bros. Dates 'American Sniper'; Moves 'Point Break', 'Man From U.N.C.L.E'". Deadline Hollywood. August 12, 2014. Retrieved August 13, 2014. ^ Gregg Kilday (August 16, 2015). "Box Office: Straight Outta Compton Breaks Out With Massive $56.1M". The Hollywood Reporter. Retrieved August 16, 2015. ^ a b c Nancy Tartaglione (August 16, 2015). "Rogue Nation Revs Up $46M More; Man From U.N.C.L.E. Spies $12M; Brothers Shows Muscle – Intl B.O. Update". Deadline Hollywood. Retrieved August 17, 2015. ^ "The Man from U.N.C.L.E." Rotten Tomatoes. Retrieved January 29, 2018. ^ "The Man from U.N.C.L.E. reviews". Metacritic. Retrieved August 18, 2015. ^ Melrose, Kevin (April 16, 2017). "The Man From UNCLE Sequel is in the Works". Comic Book Resources. Retrieved April 17, 2017. ^ "The Man from U.N.C.L.E. - Unity Connect". connect.unity.com. Retrieved January 23, 2019.